$385 RT) and Portland (less than $345 RT) = lowest in the U.S.
nights = $960 plus tax or for 5 nights = $800 plus tax. is for you. It is not too early to reserve for next year! SO CLOSE YOU CAN FEEL THE OCEAN! ocean SOUND. It is fun even when the sunsets are not spectacular. camera? No worries. Take a few steps back to your condo. IMPROVEMENTS: New CARPET throughout installed April. New 37"
vacation watching your clothes in a community facility. the crashing waves, but had to wait until morning. WOW, what a sight"
weeks on that beautiful island - and two weeks was not enough"
starting in January. I guess this says a lot too. 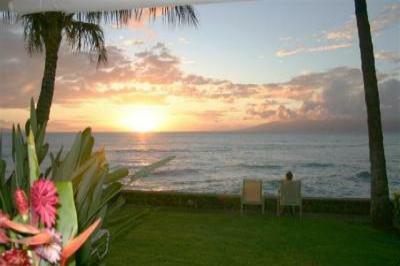 just 5 miles North of LAHAINA, and on the renoun West Side of Maui. Gas Grill BBQ areas. Beach/grass lawn chairs. dining, cinemas, music, sunset dinner cruises, hula shows. Fish & Game Brewing Co., China Boat Seafood, Aloha Mixed Plate. Click on reservations button to reserve your great vacation now.